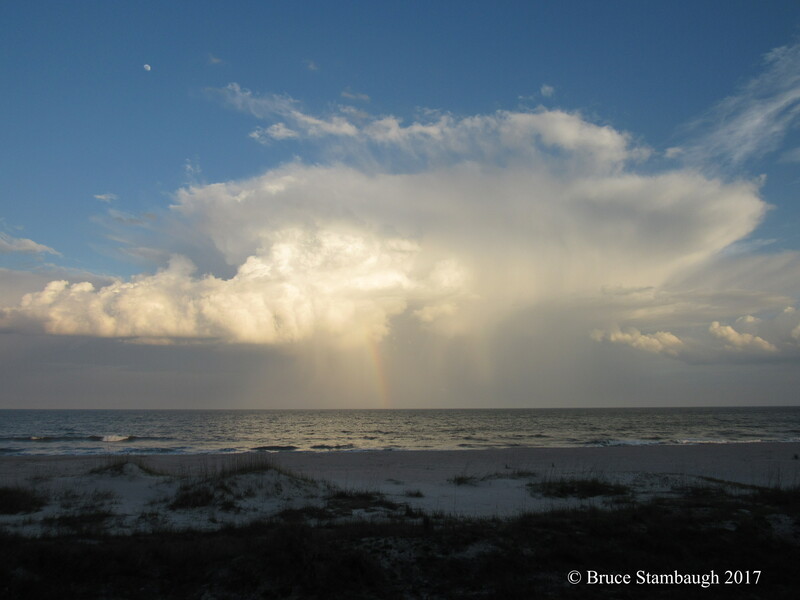 Under the watchful eye of the waxing February moon, a rogue thunderstorm glided over the Atlantic Ocean near the Florida/Georgia line. The slanting rays of the early evening sun beautifully illuminated the billowing cumulonimbus cloud and created a colorful rainbow in the process. Of course, the moon, too, reflected the sun’s warm light. “Illumination” is my Photo of the Week. Morning rainbow. © Bruce Stambaugh 2014. 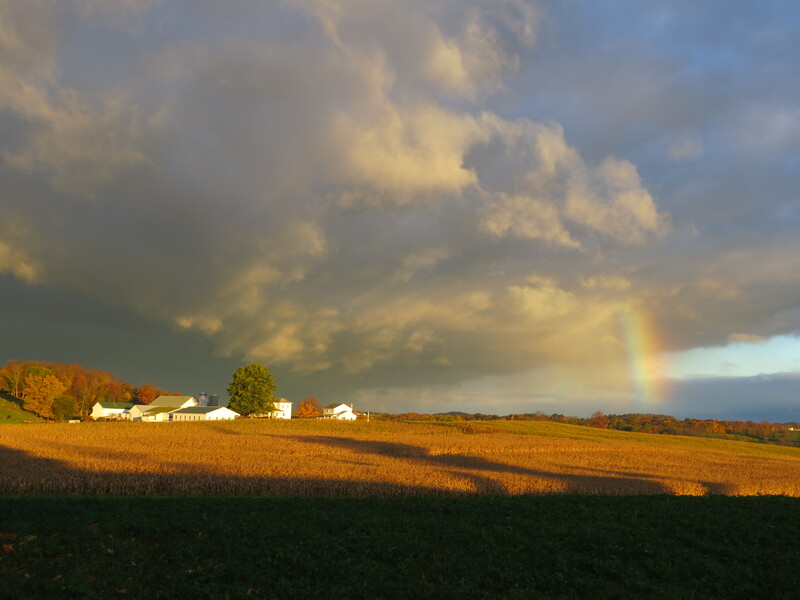 It looked like another dreary fall day in Holmes County, Ohio. The forecast called for more rain, and chilly temperatures. I sat sullenly eating my bowl of cereal. To the west, dark storm clouds gathered. Suddenly things brightened up outside. The sun had broken through the morning haze, and in an instant, the world was full of light. I ran for my camera. My eyes moved to the horizon a mile northwest of us. A white farmhouse glowed in the low, sharp-angled sun rays. The oaks and maples around the house radiated their peak colors. Then I noticed Fryburg, the little crossroads that features a cemetery, a white clapboard church building, and a white house. The sun highlighted its deciduous trees, too. The farmstead behind our house was equally illuminated. I snapped a picture from our back porch. I looked northeast and saw the top of another neighbor’s sugar maple wonderfully lit. I got that one, too. The closer the storm clouds came, the greater the contrasts. I zoomed in on two maples split by a faded farm gate leading to a pasture high on the hill behind our house. Gold and white. © Bruce Stambaugh 2014. Fryburg. © Bruce Stambaugh 2014. Green and orange. © Bruce Stambaugh 2014. Gold and gate. © Bruce Stambaugh 2014. Treeline. © Bruce Stambaugh 2014. Neighbors farm. © Bruce Stambaugh 2014. Vivid rainbow. © Bruce Stambaugh 2014. Fading rainbow. © Bruce Stambaugh 2014. I thought I was done taking pictures, until I realized I had only just begun. A brilliant, short, stubby rainbow connected the approaching storm clouds with the golden earth below. I had been so focused on the pretty details all around me that I had failed to see the obvious, a much more beautiful big picture. In my haste to capture specific images, I had overlooked the stunning scene in its entirety. The complete setting was like a jigsaw puzzle of a lovely landscape. I had been photographing individual pieces of a much prettier picture. Once I saw the countryside as a whole, however, I clicked away, occasionally zooming in on the rainbow itself. I couldn’t believe how short, wide and brilliant the rainbow was. 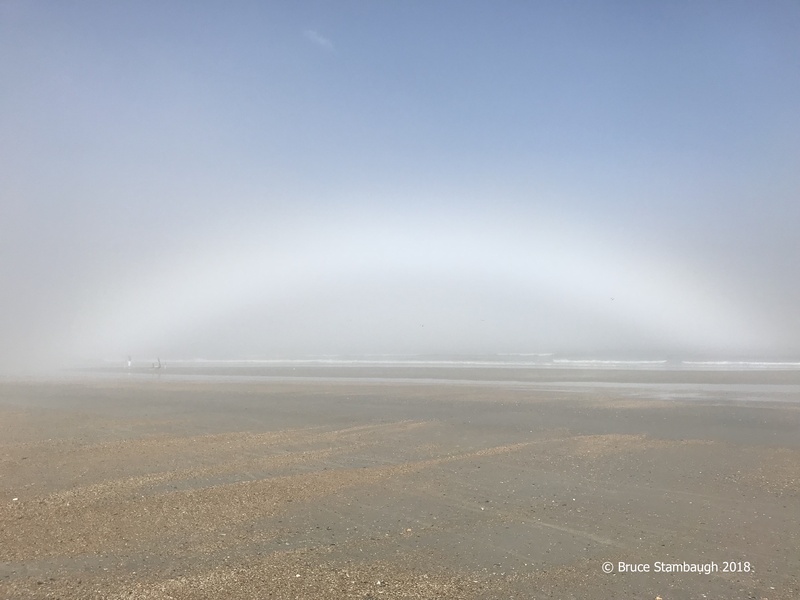 Just as it began to grow into that familiar arch, the rainbow disappeared altogether. Clouds interfered with the sun’s rays, reducing the refracting light through the raindrops that create the sky’s promise. Later I went to a local business, and took my camera to share my photos with the staff there. Before I could say anything, one person after the other asked me if I had seen the rainbow. “Wasn’t it amazing?” I asked. When they began to share what they had seen, it didn’t resemble mine at all. For them, the rainbow was to the left, thin, and arching high into the sky. My short, fat rainbow was to the right of the storm. Their perspective on the rainbow was much different than mine. Yet, we had viewed the exact same thing. Isn’t that the way with the world though? What we think is absolute and certain turns out not to be that way. All it takes is trustworthy input on the subject from a different perspective. The two angles of viewing the same grandeur were legitimate, true, and exhilarating. As spectacular as my view was of the rainbow, those captured from a different angle were equally stunning. Neither perspective was right or wrong. They just were, and both were amazing. What an important life lesson we had learned. I was overjoyed to see the rainbow from my vantage point. To see the same scene from another’s perspective made it even more spectacular. Laundered rainbow. © Bruce Stambaugh 2014. I shot this photo rather quickly. I was on an errand when these colors caught my eye. I stopped my vehicle, and took the photo out the window, zooming in between several trees. 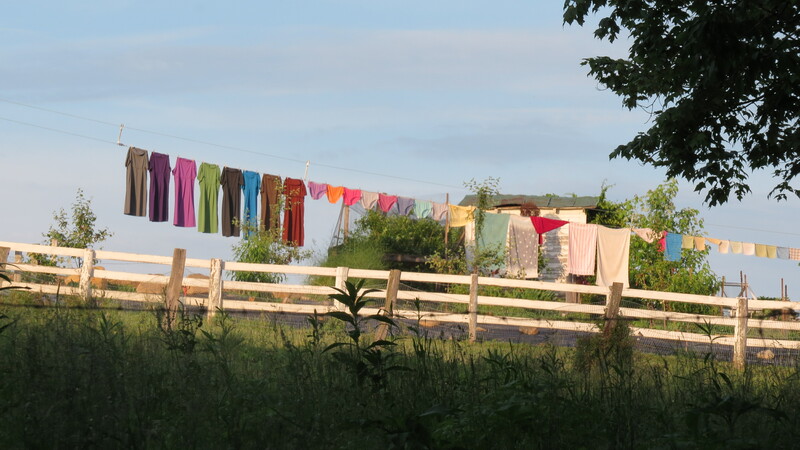 Though mostly pastel, the colors appeared bright hanging on the laundry line in the late evening sun. It wasn’t until I downloaded the picture to my computer that I realized the personal aspect of the colors. They told a story all their own about the style preferences of the woman or women in this Amish family. “Laundered rainbow” is my Photo of the Week.